After breakfast the group meets outside the hotel to board the van for the drive south to our launch point near Puerto Escondido. At the beach the guides will give a comprehensive sea kayak instruction and then we'll paddle the loaded kayaks to our first campsite. Experience a remote area few people see. Encompassing 60 miles of coastline within the Loreto Bay National Marine Park, circumnavigating Isla Carmen in a sea kayak is one of Baja's best adventures. The Sierra Giganta Range plunges into the Sea of Cortez, creating a stunningly beautiful backdrop during your Baja kayaking trip. 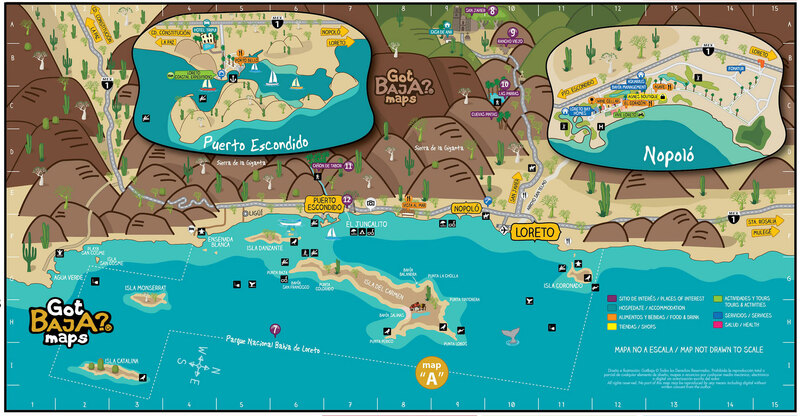 NOTE: First and last days for any Baja tour are arrival and departure days. Baja kayaking in the crown jewel of the Sea of Cortez: Carmen Island. Cliffs of red-hued basalt rising sharply out of the sea and the bold outlines of towering cacti provide the backdrop for paddling sea kayaks 60 miles on this little known, classic 9-day circumnavigation of Baja California’s Isla Carmen, the largest island in Loreto Bay National Marine Park in the Sea of Cortez (Gulf of California). While visitors frequent the southern tip of Isla Carmen, the northern part of the island is a place few humans will ever set foot. On this unique paddle, you'll have a chance to snorkel with brilliant king angelfish and lobster, watch plunge-diving blue-footed booties, and search for 60-foot whale sharks – the world’s largest fish. You'll even find a historic element on this wildlife and nature tour. Mid-way around the island, you'll make a brief stop at Salinas Bay to visit an abandoned 19th century salt mine and coral chapel. A two-day paddle rounding the island’s remote north shore leads to Balandra Bay, where you can hike an arroyo into the island’s desert interior past saguaro-like cardon cactus and wild figs in the company of desert iguanas and big-horned sheep. From your tented camps in sheltered coves, watch vermillion skies as they illuminate the banded layers of the Sierra de la Giganta range, the plume of a whale lingering in the still air, and leaping manta rays flopping back into the glassy water as guides dish out margaritas and tasty chili rellenos. Upon your arrival in Loreto take a quick cab ride to your hotel of choice (not included in tour prcie). Spend your afternoon exploring the beautiful town of Loreto. You can tour the historic Mission located in the center of town, stroll through the local market and dine on authentic Mexican cuisine before meeting your guides in the evening for an orientation meeting. Each day's paddle is 7-8 miles; or 4-5 hours of moderately paced paddling, stopping every 2 hours to rest. We'll spend the afternoons exploring by foot and snorkel. Activities include a nature hike up an arroyo, as well as opportunities for beachcombing, wildlife viewing, photography, stargazing, and swimming in crystal clear waters. After a final lunch, we break camp and paddle to our take-out site around 2 PM. Load van and proceed to Loreto. Check into your hotel. No host farewell group dinner at a favorite local restaurant. Say good-bye to lovely Loreto and head back to the airport to fly home, or, extend your vacation with a fun day tour! * Note on Itinerary: We will do our best to adhere to the schedule listed above. However, the itinerary may change due to reasons beyond our control such as wind, waves or inclement weather. Also sign me up for the ROW Newsletter. Checking this box agrees to these terms and conditions. ALL PRICES IN US DOLLARS. We will do our best to adhere to the itineraries and trip descriptions listed on our website. However, tour itineraries or sub contractors (such as taxi, cruise boats or hotels) may change slightly due to reasons beyond our control including but not limited to Acts of God, wind, waves, inclement weather or other. We always welcome you to call us to clarify any item - often this is the best way to fully clarify expectations - call us collect or on our toll-free number. You will be sent pre-trip email with latest details within a month of your tour - it is your responsibility to check in with us prior to your trip to see if you have all the information you need. We will always do our best to provide you with the best possible tour and to fully meet your expectations to the best of our ability. Is previous kayaking experience necessary? Our tours are suitable for novices. However, this particular tour is more-kayak focused than our standard Baja and BC tours, and therefore best suited to those with some prior kayaking experience or a regular fitness program. Call us with any questions! 1-800-616-1943. How do I get to Loreto? Please check out our Transportation Guide for our recommendations on how to get to Loreto. Are your tour prices in USD? Yes, all of our tour pricing is in US Dollars. What’s included in this kayak package? What’s not included? Included: Skilled professional guide services, ground transportation, motorboat-support to carry gear, snorkeling equipment, camping equipment including tents, sleeping bags, liners, and sleeping pads. Our camping trips include all meals from lunch on the first day to lunch on the last day. Not Included: Airfare, hotels before and after your tour, transportation to and from airport, gratuities, $25 National Parks & Biosphere Reserves access fees required by itinerary, and items of a personal nature. What kind of kayaks do you use? For all of our Baja tours we use high quality, fiberglass kayaks, made by Seward. The majority of our fleet is comprised of tandems, as these boats offer the greatest stability, speed, and ease of paddling. There are typically a small number of single kayaks present on the tour, which will be utilized by the guides. Depending on weather conditions, and interest, they may allow guests to rotate into singles; however this will be at the guide's' discretion based on safety and the paddling objectives for the day. We also have a limited number of solo kayaks available to reserve and use throughout the trip (for an additional cost) for paddlers who have ocean kayaking experience. Are your kayak trips motorboat supported? Yes, if at any time a guest does not want to paddle they are welcome to ride in the panga instead. Can I paddle a single kayak? We have single kayaks available to reserve and use throughout the trip (for an additional cost of $100) for paddlers who have previous ocean paddling experience. If you would like to reserve a single kayak for your trip you will need to contact our Adventure Consultants to add this to your reservation and provide a summary of your ocean paddling experience. What are the physical requirements for this trip? When stopping at shore, you should be able to climb in and out of the kayaks on your own. They will be floating in calf-deep water. Your guides are happy to assist, but balance and limberness are required. When you get to your evening campsite, all group members must to be able to help carry the kayaks above the high tide line, in teams of 6-8, before the group disperses. You will change camp sites almost every night, but may have a layover day. Camp sites are assigned by the National Park Service immediately prior to the tour. What’s camp like? Are there toilets and showers at camp? When you get to your evening campsite all group members must be able to help carry the kayaks above the high tide line. You will change campsites almost every night, but may have a layover day. Campsites are assigned by the National Park Service immediately prior to the tour. We endeavor to secure the very best campsites for the natural beauty and amenities of the area. Your guides will give a demonstration of how to set up and take down your provided dome tent. We also will provide you with a sleeping bag, liner sheet, pillow and an inflatable thermarest sleeping pad. There will be a kitchen/dining area and shade tarps where you can sit back and relax. While kayaking, we can only carry enough fresh water for drinking and cooking. There are no fresh water sources on most of the coastline and islands we visit. You can clean up with saltwater and soap off above the high tide line, or bring disposable shower wipes. A porta potty will fit into a hatch of the kayak or on the panga support boat, and will be transported to each campsite and set into a sheltered area for solid waste. Liquid waste can be expelled below the high tide line, or in a separate porta-potty bucket. Is it safe to be around whales in sea kayaks? As with all adventure travel, there is certainly an inherent risk that comes along with this sort of travel, as well as multiple external factors and variables that are outside of our control. However, we do take every measure to ensure that you and your family are in a safe situation while paddling. We paddle large, expedition style Sea Kayaks. Their size, girth, and weight make them very stable to paddle. We have never experienced a situation in which a whale has harmed a kayaker in the water. The whales are very aware of their surrounding, and we maintain a safe distance at all times. What happens if it’s too windy to paddle? If it’s too windy to paddle your guides will have alternative activities for guests to enjoy. There are opportunities to snorkel, hike or just relax on the beach with a margarita. We plan our itineraries to minimize risks posed by weather, but there is always an element of unpredictability in nature. The risk capsizing is reduced by our stable boats, but exists. All of our kayak guides are certified in kayak rescue. What are the highlights of this tour? The Islands of Loreto Bay are high traffic areas only to whales, dolphins, and other marine life! Boats are few and far between, and even other kayakers are seldom encountered. A few coves are popular lunch sites for passing boats or local fisherman, but otherwise you may feel as if you're alone in the wilderness. The Loreto Bay National Park Service assigns campsites on these islands, and only allows one group per site. Barring mix-ups or weather emergencies, your tour will have the beach to yourself. When is the best time to go to see whales in the Sea of Cortez? The islands of Loreto National Marine Park, located in the Sea of Cortez, are home for 6 different species of whales including Blue, Fin, Sei, Humpback, Bryde's and Pilot whales. From January through April look for spectacular sightings of Blue, Fin and Humpback whales in the warm, calm waters near Loreto on our Sea of Cortez Islands tours. Magdalena Bay and San Ignacio Lagoon, on the opposite side of the peninsula, are both world-renowned winter nursery grounds of the Gray whales. From late-January to mid-March is the best time to see gray whales. We operate both Gray Whale Base Camps and Kayak/Whale Watching Combos during this short season. In general, fishing in allowed in Loreto/La Paz. You would need to obtain a fishing license either before arriving or upon arrival. Our guides will not allow fishing if you are unable to produce a valid license. You will also need to bring all of your own fishing equipment. Along our kayaking routes there are areas where fishing is allowed, the guides will let you know where fishing is prohibited. Also, fishing is only allowed at the guide's discretion, as we have an itinerary, schedule and other group members that we have to take into consideration. Sea Kayak Adventures will provide you with a detailed packing list prior to your trip. We provide all of the necessary camping, paddling and snorkeling equipment, which you will need to fully enjoy your adventure. If you are interested in more specific information, check out our general Baja packing list here! If you have any questions, or need help deciding what to bring, you can call or e-mail one of our friendly Adventure Consultants at any time for some extra advice! What kind of food will I eat? Do you accommodate dietary restrictions? Our renowned wilderness meals are prepared daily by our guides using local, fresh, healthy ingredients. In Baja you can expect an authentic dining experience, with savory dishes like chiles rellenos, tostadas, ceviche, and chicken mole. We even serve delicious desserts like brownies and pineapple upside-down cake! Each morning, we serve up freshly brewed coffee or tea. Throughout the day we provide an abundance of local fruits, vegetables, and other snacks. Wine and mixed drinks are served with hors d’oeuvres each evening for happy hour. We do our best to accommodate special dietary requests, working within the parameters of the destinations in which we operate. If you have a very strict diet, we recommend packing extra snacks that you know you can eat. How many guests per tour? To keep our group size small and our impact minimal, we typically limit our tours to 14 people or less. Our standard minimum to confirm a departure is 4 guests for our Isla Carmen Circumnavigation kayak tour. What’s the weather like in Baja? Please check out this great website Weather Underground for temperature averages in Baja. Will I have cell phone reception? Contact your service provider for the best options for taking your cell phone to a different country. You are unlikely to receive cell service while paddling, but WiFi is available in many coffee shops in town. Your guides will be equipped with radios during the tour in case of emergency. Is there a single supplement fee for solo travelers? Our tour costs are based on double occupancy on any included hotel nights. Solo travelers who would like their own single hotel room can pay a single supplement (see "Dates & Rates" above for the single supplement price for this tour), or can be matched up with another solo traveler of the same gender if one is available and willing to share. If we are unable to pair you with another solo traveler, we must apply the single supplement charge to cover our hotel costs. Solo travelers will always have their own tent during kayaking tours, at no additional cost. Where can I store my luggage while I’m on tour? You can leave your luggage at your tour hotel while you are on tour. We recommend getting a luggage lock if you are leaving any electronics in the bags. We’ve never had any issues with guests leaving their bags at the hotel but it’s always better to be safe than sorry. Is there a deposit required? Is my deposit refundable? A deposit of $500 per person is required within 10 days of your reservation to hold your spaces. If the tour you are signing up for is a confirmed departure your deposit is non-refundable. For this reason, we strongly encourage you to purchase travel insurance to protect your vacation investment. US residents may purchase travel insurance directly through ROW Sea Kayak Adventures offered by Travel Insured International. If you find it necessary to cancel your trip, you should notify ROW Sea Kayak Adventures in writing, by e-mail or fax immediately. If written cancellation is received (call to verify) before the final balance is due, you will be given a refund less the amount of deposit. Deposits are not refundable. If cancellations are made on or after the final due date, no money will be refunded. If you are unable to go on the trip, you are welcome to find a replacement for yourself. Please understand that once you've signed up, we are unable to sell your reserved space to other individuals or groups. Therefore, we regret that we cannot make exceptions for personal emergencies. For this reason we strongly recommend you consider purchasing a Travel Protection Plan to protect your vacation investment. When is payment in full due? Full payment is due 60 days prior to the launch date, as indicated on your invoice. Due to the high demand for these trips, please be sure to pay your balance on time so as to not jeopardize your reservation. Your final payment must be paid by check or bank draft in US funds. Alternatively, you may pay your final balance with a credit card, but a 3% administrative fee will be added. Please fill in the form to receive more information.